The Port Douglas Sands Resort is a 4 star resort, with consists of a range of self contained accommodation apartments. This Far North Queensland resort is perfectly located opposite the Sheraton Mirage Resort and very close to Port Douglas famous 4 mile beach. The Port Douglas Sands Resort offers a comprehensive mixture of one, two and three bedroom apartments and spacious holiday rental accommodation that more than meets the needs of today's family holidaymaker, as well as providing ample entertainment and living areas within the private grounds. Two bedroom, 1 bathroom fully self contained apartment with Queen size bed and two single beds. CONTINENTAL BREAKFAST INCLUDED Overlooking tropical Pool & BBQ area. Maximum occupancy is 5 people. Additional adult $22/night. Additonal child $11/night between ages of 3-14. Cot hire is $11/night. Address : 3 Greenhills Road, Kuranda, QLD, 4881. The beautifully appointed accommodation at the Nautilus Holiday Apartments Port Douglas consist of large, modern 2 & 3 bedroom apartments, all with 2 bathrooms, full kitchen & laundry facilities, air-conditioning, private balcony, DVD player and Free lock up car parking. The Nautilus Apartments are ideally positioned only a short 200 metre walk to the famous 4 mile beach and an 800 metre walk to the centre of the Port Douglas village. The village itself boasts many great restaurants, sidewalk cafes, boutiques and galleries. When you stay at the Nautilus Holiday Apartments Port Douglas you are also just minutes away from world class golf courses, the World Heritage Daintree National Park and you can choose from over 100 different tours which depart Port Douglas daily. Spacious 2 bedroom apartment with 1 Queen Bed, 2 Single Beds, 2 bathrooms both with baths, full kitchen and laundry, spacious living and dining areas, air-conditioning and fans in each room and a private balcony or courtyard. Relax and rejuvenate your body, mind & spirit at the beautiful Palm Cove Serviced Apartments. The Palm Cove Serviced Apartments is only 24 months old and are luxuriously appointed and our facilities will ensure the Best Value Holiday & Short Term Accommodation of all of Palm Cove. Stay more than 5 Nights are receive a 15% Discount off Apres Beach Bar & Grill throughout your entire stay, 15% off Wavelength Barrier Reef Cruises & Snokeling and a FREE Memorabilia DVD, potentially saving you lots of $$$$. These large luxuriously appointed 1 & 2 Bedroom Serviced Apartments are extremely comfortable and everything is provided to ensure your stay is a memorable experience and provide 'Exceptional Value' located only 400 metres from in Palm Cove Beach Esplanade. Palm Cove, is North Queenland's Premier Tourist Seaside locality, just 20 minutes drive north of Cairns Airport. Palm Cove Serviced Apartments is an ideal base from which to explore all the attractions in the surrounding region including the Great Barrier Reef, Daintree Rainforest, Kuranda Skyrail, Cairns Night Zoo, Mossmon Gorge and Atherton Tablelands, not to mention the magnificent Golf Courses, Restaurants, Bars & Cafes and Boutique Shops all within Palm Cove itself. Select from our range of comfortable Motel-Style Studio Rooms, Deluxe One-Bedroom Serviced Apartments and Luxury Two-Bedroom Serviced Apartments that can comfortably accommodate individual travellers, couples and families. Palm Cove Serviced Apartments are located within the Mango Lagoon Resort & Wellness Spa complex which is set in 2.5 acre lush tropical garden setting with 150 metres of cascading pools with the tranquil sound of running water providing the ultimate ambience to relax, rejuvenate and revitalise your body, mind & spirit. For those wishing to indulge, one can spoil themselves and experience a range of holistic treatments and spiritual healing at the onsite wellness spa facility. The entire family have been catered for with four swimming pools, including a 50 metre Lap Pool. All of which provides the ideal environment for you to relax, unwind and enjoy your stay. All of our Apartments and Studio Rooms have air-conditioning and ceiling fans for maximum cooling and environmental efficiency. All Apartments have views of our tropical gardens and cascading pools, and the Courtyard Apartments have private direct access to the swimming pool and an outside setting for your added comfort. Palm Cove Serviced Apartments is the ideal facility that allows our guests to relax and unwind and enjoy the laid back lifestyle of North Queensland. The 1 & 2 Bedroom Apartments are fully self contained including linen, towels and a fully equipped gourmet kitchens, laundry facilities, ironing equipment, TV, Stereo, Radio, CD & DVD player. Combined with our excellent service, once you have stayed with us at Palm Cove Serviced Apartments you will never want to leave and you will certainly want to return time after time and refer your family and friends to our magnificent value for money facility. 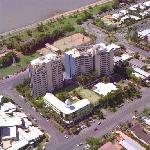 Great long term discount rates are available at the Palm Cove Serviced Apartments Queensland. Our Two Bedroom Apartments are luxurious appointed and are fully self contained, including Air-Conditioning and Ceiling Fans in all rooms for maximum cooling and environment efficiency. Our Ground floor Courtyard Two Bedroom Apartments have a private courtyard with outdoor setting which is ideal location for breakfast and dining at night. Each courtyard have exclusive access to the Lagoon Style Swimming Pool & Wellness Spa. The relaxing sound of running water and the feng shui decor and environment, forms a relaxed ambience to ensure you relax rejuvenate your body mind and spirit. Each Apartment has a fully equipped kitchen including Blanco Oven & Bench Plates, Dishwasher, Fridge/Freezer, fully equipped laundry facilities including Washing Machine, Clothes Dryer, Iron & Ironing Board. Each ensuite has a bath, shower & a modern vanity basin with stone tiled feature, concealed toilet and Hair dryer included. Our Two Bedroom Apartments, comprise of a Large King bed in main bedroom room (or King Singles can be provided on demand). Second Bedroom has two King Single Beds (or King Bed on demand). Separate living/dining area and fully equipped kitchen including dishwasher, oven and bench plates and full size fridge freezer. Apartments have a TV, DVD, Hi-Fi, CD player and radio. DVD's can be hired. Our Two Bedroom apartments are all luxurious appointed and fully self contained, including Air-Conditioning and Ceiling Fans in all rooms for maximum cooling and environment efficiency. Should you book with us, your Luxury Two Bedroom Apartments will overlook the lush tropical landscaped gardens and the Lagoon Style Swimming Pool & Wellness Spa. The relaxing sound of running water and the feng shui decor and environment, forms a relaxed ambience to ensure you fully relax rejuvenate your body mind and spirit. Each Apartment has a fully equipped kitchen including Blanco Oven & Bench Plates, Dishwasher, Fridge/Freezer, fully equipped laundry facilities including Washing Machine, Clothes Dryer, Iron & Ironing Board. Each ensuite has a bath, shower & a modern vanity basin with stone tiled feature, concealed toilet and Hair dryer included. Our Two Bedroom Apartments, comprise of a Large King bed in main bedroom room (or King Singles can be provided on demand). Second Bedroom has two King Single Beds (or King Bed on demand). Separate living/dining area and fully equipped gourmet kitchen. Apartments have a TV, DVD, Hi-Fi, CD player and radio. A broad range of DVD's re available for hire. Located only a 15 minutes drive from Cairns International Airport and right on the beachfront of Trinity Beach, On The Beach Holiday Apartments comprise of one, two and three bedroom apartments that are all well appointed and thoughtfully designed for the tropical lifestyle of Far North Queensland. On the Beach Holiday Apartments feature private balconies, kitchen facilities, private laundry facilities and air-conditioning. Our range of self contained apartments include our Garden view Apartments, Ocean view Apartments (which have views from Cairns to Palm Cove) and our absolute Beach front Apartments with stunning views of the beach and ocean. All of these Cairns apartments are within 40 metres of Trinity Beach and are housed in separate buildings, each with their own pool and landscaped BBQ area. If its privacy, relaxation and tranquillity that you desire, then On The Beach Holiday Apartments can provide the perfect accommodation for your next visit to Trinity Beach. Address : 49-51 Vasey Esplanade, Trinity Beach, Queensland, 4879. Directly opposite beautiful Trinity Beach, these tastefully appointed apartments offer relaxed beachfront living with two bedroom,two bathroom large balconies and spacious living areas. Fully self-contained, including full kitchen, dishwasher, ironing facilities and laundry facilities Austar cable TV. These apartments represent the perfect seaside retreat. Fully self-contained, 2 Bedroom two bathroom Apartments including full kitchens, ironing and full laundry facilities, these spacious and tastefully appointed apartments Set amidst lush tropical gardens and just a barefoot stroll away from golden sandy beaches and a wonderful selection of restaurants and eateries. Fully self-contained two bedroom, two bathroom, including full kitchens, ironing and full laundry facilities, these spacious and tastefully appointed apartments boast large sea facing balconies that capture magnificent sea breezes and panoramic ocean views. Set amidst lush tropical gardens and just a barefoot stroll away from golden sandy beaches and a wonderful selection of restaurants and eateries. Agincourt is a resort style complex of 4 star luxury one and two bedroom apartments on a large ocean and beachfront site at Clifton Beach, considered Cairns' most beautiful beach. Clifton Beach is located just 20 minutes north of the Cairns central business district, 15 minutes north of the international airport and five minutes south of Palm Cove. Whilst on his voyage of discovery of Australia, Captain Cook described it as the finest beach in the north of the great land of Australia. It is truly an idyllic setting where you can launch yourself into an adventurous and exciting experience or settle under the coconut palms to relax and unwind - either way, you're in for a great holiday. First time visitors will be surprised to learn of the extensive selection of tourist attractions that are available in Tropical North Queensland. To name a few - Great Barrier Reef, Daintree Rainforest, Skyrail - The Rainforest Cableway. Agincourt Beachfront Apartments offer 25 beachfront apartments with views through the coconut palms to the beach and the sparkling Coral Sea as well as an additional 20 garden apartments overlooking the lush tropical gardens, 20 metre heated lap pool, cabana and barbecue area. Every Agincourt apartment is beautifully appointed. Large living areas are finished in cool white satin tiles which lead onto your own spacious private balcony with delightful views. All apartments are air-conditioned, offer wireless internet access and are equipped with self catering facilities in the kitchen with microwave, full size refrigerator, oven, crockery/cutlery and cooktop. Ceiling fans are fitted throughout all apartments, a colour television, FREE Cable TV, DVD player, Facsimile/Modem point, safe and ISD phone in the living room and your private bathroom has a shower, washing machine, dryer, iron/ironing board and hair dryer. The apartments are situated in two buildings and for your convenience both buildings are serviced by lifts. Premium linen and ironing facilities are included. Each apartment has a queen size bed or 2 single beds in the bedroom and a double sofa divan in the living room. Apartments are non smoking and serviced weekly or by arrangement. When it comes to relaxing and enjoying the tropics, Agincourt offers every chance to unwind. Stroll along the white sandy beach to nearby Palm Cove or Kewarra Beach. Swim in the Coral Sea right at your door or you may prefer to relax by our large salt water lap pool. The gardens at Agincourt are a lush and tropical sanctuary for a wide selection of birds, parrots and home to the Cairns Birdwing Butterflies. Garden lovers will delight in the colourful range of local and exotic orchids growing naturally on the rainforest palm trees. And when the mood takes you, enjoy a cool drink or cook a steak on our free gas barbecue under cover in the spacious pool side Cabana or go for swim in our Heated Outdoor Lap Pool. Enjoy the fascinating beauty of Australia's tropical wonderland where Agincourt Beachfront Apartments nestle behind the coconut palms fringing the Great Barrier Reef at Cairns' secluded and most beautiful Clifton Beach. Ideal family accommodation. The 2 Bedroom 2 Bathroom Ribbons Beachfront Apartment is located in the building adjacent to Agincourt. The apartment is a fully self contained, spacious and non smoking apartment, featuring a large private balcony with ocean glimpses, 1 Queen Size Bed in the seperate master bedroom, 2 Single Beds in the second seperate bedroom, air conditioning, a fully equipped kitchen with microwave, full size refrigerator, oven, crockery/cutlery, dishwasher and cooktop, a private bathroom with corner bath, shower and hairdryer, private laundry facilities including washing machine, dryer and iron/ironing board, ceiling fans, colour television, DVD player, CD player, direct dial phone, wireless internet, alarm clock, radio, insect screens and all linen and blankets. The apartment is serviced weekly. The rate is for 4 guests. Maximum occupancy is 5 guests. The extra adult guest charge is $20 per night. The extra child guest charge( for children aged 14 and under) is $10 per night. Children aged 3 and under stay FREE of charge if using existing bedding. Cots are available for an extra charge of $5 per night. Ideal family accommodation. The 2 Bedroom 2 Bathroom Arlington Garden/Pool View Apartment is located in the building adjacent to Agincourt. The apartment is a fully self contained, spacious and non smoking apartment, featuring a large private balcony with ocean glimpses and a second balcony overlooking the 10m pool and gardens. The apartment offers 1 Queen Size Bed in the seperate master bedroom, 2 Single Beds in the second seperate bedroom, air conditioning, a fully equipped kitchen with microwave, full size refrigerator, oven, crockery/cutlery, dishwasher and cooktop, a private bathroom with SPA BATH, shower and hairdryer, private laundry facilities including washing machine, dryer and iron/ironing board, ceiling fans, colour television, DVD player, CD player, direct dial phone, wireless internet access, alarm clock, radio, insect screens and all linen and blankets. The apartment is serviced weekly. The rate is for 4 guests. Maximum occupancy is 5 guests. The extra adult guest charge is $20 per night. The extra child guest charge( for children aged 14 and under) is $10 per night. Children aged 3 and under stay FREE of charge if using existing bedding. Cots are available for an extra charge of $5 per night. Only meters to the beach! Ideal family accommodation. The 2 Bedroom Beachfront Apartment Sand Cay is located at Sand Cay, 150m from Agincourt. The apartment is a 3.5 star fully self contained, spacious and non smoking apartment, featuring views beautiful views of the coconut palms, the beach and the sparkling Coral Sea. The apartment offers 1 Queen Size Bed in the seperate master bedroom, 2 Single Beds in the second seperate bedroom, air conditioning, a fully equipped kitchen with microwave, full size refrigerator, oven, crockery/cutlery, dishwasher and cooktop, a private bathroom with shower and hairdryer , private laundry facilities including washing machine, dryer and iron/ironing board, ceiling fans, colour television, DVD player, CD player, direct dial phone, wireless internet access, alarm clock, radio, insect screens and all linen and blankets. The apartment is serviced weekly. The rate is for 4 guests. Maximum occupancy is 5 guests. The extra adult guest charge is $20 per night. The extra child guest charge( for children aged 14 and under) is $10 per night. Children aged 3 and under stay FREE of charge if using existing bedding. Cots are available for an extra charge of $5 per night. The Daintree Rainforest Retreat is a small boutique motel situated in the heart of the World Heritage listed Daintree/Cape Tribulation National Park. Daintree Rainforest Retreat are proud winners of the 2005 Douglas Shire Council small business award for Developing Sustainable Enviromental Communities - Winner of the Prestigeous Sustainable Environment Award. Winners of Cairns Garden competition awards. Running almost entirely on clean and quiet energy from the sun, the retreat is carbon neutral. The Daintree Rainforest Retreat does NOT have noisy generators to disturb your enjoyment of this unique forest by the Coral sea. Daintree Rainforest Retreat is located 11kms north of the Daintree River Crossing in the heart of the beautiful rainforest in an area known as Cow Bay (the area known as Cow Bay is named after the Sea Cows or Dugongs that graze on the sea grass meadows in the bay). It is truly a beautiful part of the Daintree, rich in rare flora & fauna, from the most colourful butterflies, to the endangered cassowary, Australia's second largest bird. Cairns Airport, the International gateway to Tropical far North Queensland connects to Cow Bay via the sealed, all weather Cook Highway and the famous picturesque, Daintree River Ferry crossing. The Daintree Rainforest Retreat Motel is a small boutique style motel resting on 1 hectare (2.5 acres) of tropical gardens in which lives a wide variety of wildlife that often come to visit guests whilst they are relaxing or enjoying a barbeque. The tropical gardens hold many botanical wonders such as the many varieties of bromeliads, orchids, king ferns, vanilla trees, huge fig trees, spectacular vines etc etc and is a very inviting relaxing place, to while away some time. The motel suites reflect the environment, with bright airy decor and high quality inclusions. The Retreat prides itself on cleanliness and good service. All accomodation has delightfully high ceilings, 24hour POWER, comfy queen size bed, ceiling fans, TV, a kitchenette with microwave, jug, toaster, china & cutlery and cooking equipment, sofas, as well as a private ensuite bathroom and spacious verandah furnished with cane chairs. The Daintree Rainforest Retreat further features a large saltwater swimming pool, which is open till 10:00pm and a wonderful outside covered BBQ area, providing a free gas BBQ with all cooking utensils. If you are lucky enough to bring back a Barramundi or a reef fish, please feel free to make use of our free gas B.B.Q. If not, perhaps buy a crocodile, kangaroo or beef steak to grill on the BBQ yourself! The retreat also has regular visits of a number of cassowaries coming to the property due to the large number of food trees located there. Cow Bay boasts some fine Restaurants and Cafes all within easy walking distance from the Retreat and some will even cook your catch for your dinner. The pristine Cow Bay beach, only 5 minutes by car, a delightful bike ride of 15 minutes or a leisurely stroll of 30 minutes is typical of Far North Queensland, where the RAINFOREST meets the REEF. Get away from the crowded beaches of the south, stretch out on our golden sands to add to your tan or sit back and enjoy the scenery under a shady tree only metres from the water. Cruise the beautiful Daintree River or Coopers Creek, photographing unique wildlife including saltwater crocodiles. A meander along the JINDALBA, MARDJA or FAN PALM all weather board walks will enthrall as you pass huge trees centuries old, and tiny delicate ferns some dating back millions of years. For the more adventurous, climb the TREE TOP TOWER at the DAINTREE ENVIRONMENT CENTRE ,where you can take in every level of the forest right up to the canopy some 23 meters (75ft) high. Enjoy a 4WD Tour of the Rainforest or venture further to Cooktown, with one of the many experienced tour operators in the area. Adventure to a CROC SPOTTING tour or a NIGHT TOUR of the Jungle. If coming face to face with some of the wildlife of the area makes you thirst for more, then spend some time in the INSECT MUSEUM. Or walk some of the many trails. But no holiday to Far North Queensland would be complete without a trip out to the GREAT BARRIER REEF. Be it fishing with experienced guides that can take you out to a world of piscatorial heaven, (you can bring your own boat too!) or SNORKELING & DIVING with the crew on one of the local reef tours, taking you out to unspoiled reefs of multi-coloured fish and coral. Some of the best reefs of the whole Great Barrier Reef system start from the Cow Bay offshore area due to the lack of agricultural run off from the mainland. If you want to see the Reef in its natural state, Tropical Far North Queensland is the place to go. The Retreat is happy to organize and pre-book your tours to ensure you don't miss out, providing a full tour booking service. (Great discounts available)!! Rated No 1 in the Daintree! Only Douglas Enviro AWARD retreat on Daintree coast. The Cassowary 2 Bedroom Apartment is ideal family accomodation. delightfully decorated in tropical decor. The aprtment comprises 1 Queen Bed in the master bedroom & 3 single beds in the second bedroom, night tables, a private ensuite bathroom with shower and toilet, kitchenette with microwave, tea & coffee making facilities, fridge, toaster and china/cutlery, lounge furniture, coffee table, TV, DVD player, CD player, desk, dial-up internet access, insect screens, ceiling fan, 24 hour power, alarm clock, radio, ironing equipment, laundry facilities including washing machine and dryer, hairdryer and a spacious verandah with comfy chairs overlooking tropical gardens. Rate is for 4 guests. Maximum 5 guests. Extra guest charge is $17 per guest per night. Please note - 10% Discount at the restaurant and on tours to the Great Barrier Reef. Cots are available at extra charge. Trinity Beach Club Holiday Apartments is a modern 4 star complex of 35 one and two bedroom fully self-contained apartments situated only 200 metres from the palm fringed shores of Trinity Beach, and a leisurely 2 minute walk to a selection of casual eateries and beachfront restaurants. Our two bedroom two bathroom mezzanine style apartments accommodate up to 5 people, while our one bedroom apartments comfortably sleep up to 3 people, and all apartments have kitchen and laundry facilities, Austar cable TV and private balconies or courtyard. The apartments are set amidst lush tropical gardens overlooking the large resort style pool and large dining cabana area which has BBQ, gas cook top and oven. Also for our guests enjoyment is a 10 person outdoor heated spa pool and our guests have full use of the Trinity Beach gym. Offering a pleasant and relaxed environment, Trinity Beach Club Holiday Apartments can offer you the holiday that you’ve been looking for! 2 bedroom apartments are a mezzanine style apartment with queen size bed in the master bedroom upstairs and either a double or twin beds in the second bedroom downstairs. They also contain 2 bathrooms, lounge/dining area, kitchen facilities comprising fridge/freezer, microwave and hot plate, private balcony or patio, airconditioning and ceiling fans and washing machine, dryer, iron and ironing board in all apartments. A fifth guest can be accommodated on a rollaway bed for an additional $30 per night. Waterfront Terraces 4½ star, Luxury Holiday Apartments are superbly located on the quieter northern end of Cairns Esplanade, overlooking Trinity Inlet and the parkland foreshore of Cairns Harbour. All apartments have ocean views and are delightfully 'Queensland' in style. The property is within walking distance to all the city has to offer and approximately a $14 taxi fare from the airport. It offers 22 fully self-contained 1 & 2 bedroom luxury apartments with cooking facilities, free Austar, stylish furnishings and air-conditioning that are serviced weekly. As well as a internet connection in your room, the reception offers a computer with broad band access for guest use, so you can keep in touch with those emails. We have an Information/Tour Desk which features all quality operators in Cairns, giving you a variety of sight-seeing options to suit your personal needs. The staff will pre-book your tours free of charge or discuss your tour needs on arrival. Most tour operators will pick you up at our door. So whether it's heading out on tour or spending time around our pool and barbeque, we feel certain that you'll love staying with us at Waterfront Terraces. The Grand Mercure Rockford Esplanade, Palm Cove is located on a palm-fringed tropical beach with the pristine blue waters of the Coral Sea providing a lazy border where two world heritage sites merge together, the Great Barrier Reef & the spectacular Daintree Rainforest. Offering a choice of studio, one and two bedroom apartments, all featuring a balcony and designed to complement the area's magnificent natural environment. Guests have access to a host of resort facilities including a freeform lagoon style pool, and gymnasium. Be inspired by the magnificent views from our exclusive beachfront restaurant and bar. Roydon Beachfront Holiday Apartments comprises 20 spacious 1, 2 and 3 bedroom apartments which are clean, well maintained, self contained and fully equipped. The apartments are spacious and well appointed, offering generous open-plan living, large picture windows and each has its own extensive and private balcony or patio, just the place for relaxing with a cool drink and a good book, where you can savor the tranquillity and enjoy the sea breezes. Further features include SPA Bath, air conditioning, ceiling fans, insect screens, full kitchen & cooking facilities including microwave, stovetop and oven, dishwasher, large refrigerator/freezer, 2 bathrooms in 2 &3 bedroom apartments, 2 TVs, Austar cable TV, CD / radio / music system, video / DVD player, wireless broadband internet access, telephone - ISD / OTTC / voicemail / data jack, own laundry with washing machine & clothes dryer, Queen Size beds in master bedrooms, clock, radio, hairdryer, all linen, iron/ironing board, picinic set and esky cooler (chilli bin) - great for going to the beach. linen. The apartments are serviced weekly or on request. Quality fittings and cane furniture feature throughout each apartment, all of which boast a huge living area of between 140m2 to 186m2 (l4sq to 2Osq) in size. That's the size of an average home! The apartment accommodation offers low-rise, modern facilities, sensitively built to blend with the tropical character. All apartments face the beach. Enjoy views past swaying palms and tropical landscaping. Set amidst one acre of beautifully landscaped tropical gardens and established palms, The Roydon is noted for its easy and relaxed atmosphere. All levels are serviced by stairs and a lift which provide effortless access to every apartment and the buildings solid construction further ensures your privacy and limited disturbance. Enjoying "Time Out" and relaxing at The Roydon is your privilege, either in the seclusion of your comfortable accommodation and surroundings, or on a section of golden beach. You may prefer to laze by our saltwater swimming pool or enjoy a barbeque in the serenity of the tropical gardens. Directly opposite there is the golden sand and activities on Trinity Beach to provide further enticement to those who enjoy a variety of watersports. For guest convenience, a Tour Desk is provided where friendly staff will assist with all tours and car-hire. Roydon Beachfront Apartments is ideally located near the Great Barrier Reef just off Cairns and offers the perfect base for all your Tropical North Queensland vacation adventures including diving, fishing, rainforest and outback tours, rafting and reef tours. 2 international golf courses, Skyrail cableway, Wild World Tropical Zoo, and Tjapukai are just 10 minutes from Trinity Beach; while Port Douglas, Mosman Gorge, the world heritage listed Daintree Rainforest and the Cairns Highlands Lakes and Waterfalls are just an hour or less away. With everything available at The Roydon Beachfront Apartments you'll only need to bring your personal effects and a beach towel. BEST VALUE FOR MONEY SPECIAL!!! The 2 Bedroom 2 Bathroom Spa Apartment is clean, spacious, well maintained, self contained, well appointed and fully equipped, offering generous open-plan living, large picture windows and a large private balcony or patio - just the place for relaxing with a cool drink and a good book, savoring the tranquillity and enjoying the delightful tropical garden views and sea breezes. The 2 bedroom apartment comprises a seperate master bedroom with 1 Queen bed and private ensuite bathroom, a second bedroom with 2 Single Beds, a second bathroom with SPA BATH and shower, a full kitchen with microwave, stove, oven, large refrigerator/freezer and dishwasher, air conditioning, ceiling fans, insect screens, 2 TVs, Austar cable TV, CD / radio / music system, video / DVD player, wireless broadband internet access, telephone - ISD / OTTC / voicemail / data jack, own laundry with washing machine, clothes line/airer & clothes dryer, alarm clock, radio, hairdryer, all linen, iron/ironing board, picnic set and esky cooler (chilli bin) - great for going to the beach. The apartment is serviced weekly or on request. The rate is for 4 guests. Maximum 6 guests. Extra guest charge is $25 per guest per night.Children under 3 years of age stay free if using existing bedding. Cots are available at an extra chrage ( $10 per night). Marlin Cove is set amongst 10acres of extensive tropical gardens, fringed by a rainforest corridor and populated with native bird life. This unique resort is located on the northern beaches of Cairns and only a few minutes walk to beautiful Trinity Beach. Marlin Cove Resort is uniquely positioned in the privacy of 10 acres, however close to many popular destinations and activities . The renowned Great Barrier Reef is almost on your doorstep offering spectacular snorkelling, diving and swimming opportunities. At Marlin Cove, you can relax on your private balcony with family and friends watching life move by you. Our guests are able to walk directly to Trinity beach, around to the rainforest corridor or the beach front restaurants and cafes or for some retail shopping therapy. Marlin Cove resort offer distinct accommodation choices with our one bedroom, two bedroom and three bedroom apartments providing guests with comfort and privacy during their stay. All are fully self-contained with large living areas, ensuites and private balconies. The views are addictive, the cable television is free and the living area roomy. A large lagoon style pool, spa, sauna, gym, tennis court and barbecue areas make Marlin Cove one of the premiere apartment complexes in far north Queensland. Just Imagine, No deadlines. No work. Beachfront On Trinity - a relaxing tropical paradise with stunning ocean views, perfectly created to soothe the mind and enrich the soul. Warm lazy days, romantic tropical nights, excitement and lots of choices - where you can choose from a host of activities or sit back and relax and do nothing at all. Beachfront On Trinity - directly opposite the beach, a place thats affordable and modern, uniquely designed to respect your comfort and enjoyment - where the whole feeling is one of space, position and privacy. To put it simply, Beachfront On Trinity Beach Apartments offers only only one schedule - yours! Here, only steps from your door, a long idyllic stretch of golden beach fringed with swaying palms beckons you to leave footprints in the sand. The sunrise greets you over the sparkling aqua waters of The Great Barrier Reef. From your balcony the stunning ocean views of the Coral Sea will take your breath away - in a word, "WOW". There's definitely an attraction to feeling the sand between your toes and enjoying the sea at your feet. Sensitively built to blend with the tropical character of trinity Beach, Beachfront On Trinity Beach Apartments unites premium holiday accommodation with lifestyle components that set new standards for the area. Luxuriously casual, this Ocean Beach view accommodation on Trinity Beach commands a central village location studded with coconut palms and complimented by the beautiful sandy shores of the Great Barrier Reef. Beachfront On Trinity 1 & 2 bedroom apartments are fully self contained, situated directly opposite the beach featuring either spectacular beach/ocean views of stunning tropical/mountain views from your own private furnished balcony. The apartments are spacious, clean and airy with lots of natural light, full air conditioning and screens, designer kitchen with granite bench tops, full private laundry facilities, ceramic floor tiles in all living areas, modern designer fittings, stainless steel appliances, luxurious bathroom and en-suite, ceiling fans, 2 cable TV's, music sytem, and DVD player as well as wireless broadband. These Beachfront apartments are nestled in lush tropical landscaping. The outside entertainment areas include an outdoor swimming pool and large spa. Further facilities include a lift/elevator, internet cafe, tour desk, FREE off-street undercover parking, facsimile/business services, babysitting/child minding services, cot /high chairs/strollers available, masssage therapy and resident managers. All day tours pick up and return from the on-site tour desk. Beachfront on Trinity "The best Beach-side holiday." A great home base for all of your far North Queensland Adventures, including diving, fishing, golf, rainforest and outback tours, rafting and reef tours. Close to all of the popular attractions and conveniently nestled amidst beach side shops and casual alfresco eateries, Beachfront On Trinity offers a holiday experience with a difference - where getting away from it all doesn't mean going without! With its enviable beachfront address and unique modern design, the impressive Beachfront on Trinity embraces quiet relaxation and a refreshing tropical lifestyle. It's all here, the only thing missing is you! ONLY 10 SECONDS TO THE BEAUTIFUL SANDY BEACH!! GREAT POSITION! The Two Bedroom 2 Bathroom Beachfront Apartment is spacious, clean and airy with lots of natural light and is fully self contained, featuring a spacious private furnished balcony with sunlounge and spectacular beach/oceanviews, 1 King bed in the master bedroom with its own TV and luxury private ensuite bathroom, either 1 King bed or 2 Single Beds in the second bedroom ( please specify preference in the Special Requests Section of your booking), modern designer fittings, full air conditioning with temperature control and screens, designer kitchen with granite benchtops and stainless steel appliances including dishwasher and full size refrigerator, a second luxurious private bathroom with shower, very spacious living area, desk, a big screen colour TV, satellite/cable TV, telephone with data port, voicemail, private laundry with washing machine, clothes line/airer, iron/ironing board and clothes dryer, ceramic floor tiles in all living areas, wireless broadband, music system, DVD player, CD player, Wii game console, ceiling fans, alarm clock, hairdryer, safe and radio. The rate is for 4 guests. Maximum occupancy is 6 guests. Extra guest charge is $25 per night. FANTASTIC VALUE FOR MONEY! An easy 2 minute walk to choice of 7 Restaurants and new Trinity Beach Tavern with Meals and Gaming room. Palms at Trinity is ideally located only 3 minutes walk to the beautiful, award winning Trinity Beach. Palms at Trinity is a smaller complex offering personal friendly service and attention. Palms at Trinity offer guests a courtesy transfer from Cairns airport, between 8am-6:30pm. Please contact the number on your Booking Confirmation to arrange this. Resort amenities and facilities include a freeform swimming pool, spa, BBQ, entertainment facilities and more. Palms at Trinity is centrally located for all tours and Tropical North experiences. Snorkel, dive, sail, fish, 4WD safaris, interpretive tours it's all here. The tour desk can arrange all of your adventures to suit your needs. Tour operators will pick up at Palms at Trinity or close by. Palms at Trinity is located only 25 minutes to Cairns City. Cairns City offers retail therapy, world class golf courses, Tjapukai Aboriginal Park, wildlife parks, skyrail, cable skiing, bungy jumping and more. Trinity Beach is also centrally located to 2 natural wonders to explore - the Great Barrier Reef and the ancient Daintree Rainforest. Palms at Trinity offers competitive rates and, with an on-site management team seeing to all your accommodation needs, your holiday will be relaxing & stress free. Our beautiful tropical gardens, pool and BBQ ensure guests have an enjoyable and memorable stay. Join us for your stay in the Tropical North. Only a short stroll to the beach, restaurants and cafes, Palms at Trinity is located off the main road, offering quiet relaxed surroundings for an enjoyable holiday. The 2 bedroom apartment features a balcony/courtyard with views of the swimming pool/tropical gardens and comprises a master bedroom with a queen size bed, a second bedroom with 2 single beds, a private bathroom with shower over bath, a fully equipped kitchen with full size refrigerator, private laundry facilities including washing machine, dryer, clothes line/airer and iron & ironing board, seperate lounge room, air conditioning, ceiling fans, alarm clock, broadband, DVD player, radio, colour TV and Wireless / WiFi. Rates are for 4 guests. maximum 5 guests. Extra guest charge $19.00 per night. You'll love the new look Rendezvous Reef Resort, a village of villas in the heart of Port Douglas. Nestled in a magical tropical garden setting, it's ideal for those seeking a romantic getaway for two or a fun-filled holiday for the whole family. You'll never be short of space and privacy, with each two storey villa offering an enormous 110 square metres of living space, set in a unique landscaped garden layout. This is double the size of competing Port Douglas resorts, which means that at Rendezvous Reef Resort you get a house for the price of a room. Best of all, Rendezvous Reef Resort is just minutes from charming Port Douglas Village and a short walk from famous Four Mile Beach, making it the ideal base from which to explore the only place on earth where two world heritage listed jewels collide - the Great Barrier Reef, and the Daintree Rainforest. Rendezvous Reef Resort is currently undergoing an $8 million extreme makeover. Our rejuvenated villas offer brand new kitchens and bathrooms, contemporary furniture, luxury flat screen televisions and refreshing air conditioning to escape the tropical heat. Villas are clustered in groups across 15 acres of tropical gardens, meaning the refurbishment team is able to work on one group at a time, significantly reducing the refurbishment's impact on guests. Our Tennis Courts are currently out of order due to resurfacing. Have fun with friends or the bring the kids! Spacious two storey villa with garden or pool view, balcony or patio, kitchen, two bathrooms, separate laundry with washing machine and clothes dryer, high speed broadband internet access, TV and DVD player. 110 square meters of living space! Sleeps 4. Extra guest $22 per night. Offering 1 & 2 Bedroom Fully self contained Apartments, the Lychee Tree has something for everyone looking for quality accommodation which does not break the budget. Perfect for families, couples or groups of friends, Lychee Tree apartments are air conditioned and have full cooking and washing facilities. A TV and DVD Player are also located in your home away from home. Lychee Tree has a gorgeous salt water resort pool, with a shallow end for the kids. Comfortable sunlounges surround the pool along with swaying palm trees to complete your relaxation in the tropics. Pool toys are available, and there are swings within the complex. A complimentary tour desk is available on site. With so many tour companies around, we pride ourselves on our ability to tailor the various options on offer to your own needs and requirements at the same rate as the operators themselves. What ever you choose to experience whilst in far north Queensland, the Lychee Tree is the perfect place to begin your adventures! 2 bedroom Port Douglas apartments with a Queen & 2 or 3 Single Beds, 1 Bathroom, Air-conditioned Lounge, Balcony, Bath, Dryer, DVD Player, Freezer, Fridge, Hair Dryer, Internet Access, Iron/Ironing Board, Kitchen, Linen Provided, Microwave, Outdoor Furniture, Oven, Telephones, Television Lounge, Video Player and Washing Machine. A Rollaway Bed is also available. Located just a short 3 minute stroll to Four Mile Beach and the action of fishing, sailing and kite surfing, the new Oaks Lagoons Port Douglas offers a relaxed getaway. Whether it be lazing in a deck chair by one of the six Lagoon style pools, sitting on your swim up apartment balcony, or Barbecuing the 'catch of the day', you can reflect on your day within a tropical landscaped setting and catch the ocean breeze. Accommodation styles vary from studio rooms with large corner spas, to one and two bedroom apartments complete with gourmet kitchen and laundry facilities, to rooms with swim out option or apartments with their own private plunge pool and spa. No matter which style of accommodation you choose, all rooms offer air conditioning, king beds, broadband connectivity and balcony. With extensive knowledge of the surrounding region including the Great Barrier Reef and Daintree Rainforest, Oaks Lagoons can arrange your day tour with transfers, or they can seat you on one of their quality mountain bikes and steer you towards some of the best cafes and restaurants in Port Douglas. These 2 Bedroom apartments in Port Douglas have 2 King or 4 Single beds, a private courtyard, air-conditioning, ironing equipment, private laundry facilities, hair dryer and a full kitchen. These 2 Bedroom swimout apartments in Port Douglas have 2 King or 4 Single beds, a private courtyard with direct access to the 42m lagoon pools, air-conditioning, ironing equipment, private laundry facilities, hair dryer and a full kitchen. A heavenly retreat and luxurious Port Douglas accommodation awaits at Coconut Grove Apartments Port Douglas - north Queensland's most impressive holiday destination. Situated in cosmopolitan Macrossan Street, just 140 metres from magnificent Four-Mile Beach, divine views of rainforest mountains and blue seas can be enjoyed in absolute privacy from a choice of 33 glamorous 1, 27 3 bedroom holiday apartments and penthouses that come complete with their own outdoor entertaining terrace - extending seamlessly from sophisticated living areas - so self-contained, you will never want to leave. Coconut Grove Resort is a beautiful five star property set right in the heart of Port Douglas. This stunning upmarket holiday experience is unsurpassed in style and sophistication with its contemporary inspired design. Set right in the heart of Port Douglas, you can explore the area on foot, and indulge your senses with fantastic restaurants and bars, boutique shopping or day tours to the Great Barrier Reef. As a holiday destination, Port Douglas is in a class of its own – a paradise found for the most discerning visitor craving relaxation with a certain je ne sais quoi. Chic boutiques, cool eateries, restaurants and internationally-celebrated resorts and golf-courses are the perfect foil to nature’s veritable patchwork of World Heritage listed rainforest, verdant cane fields and Coral Sea. Inside Coconut Grove, time will be forgotten, endless days spent however you choose. Guests can choose from Terrace, Balcony or Penthouse apartments. All Terrace and Penthouse apartments feature their own private plunge pools and spas; while all apartments and penthouses are fully self-contained with spacious and fully-fitted kitchens complete with stainless Miele appliances, living areas with plasma televisions, dining and large outdoor entertaining terraces with undercover barbecue facilities. The resorts calming water features and lush tropical setting will satisfy the most discerning holidaymaker. For shared guest enjoyment, facilities include a reception and tour desk with professional and service oriented resident managers, landscaped gardens, beautiful swimming pool with 20 metre lap pool, spacious entertaining area with cooking facilities and secure, below ground parking. With Coconut Grove’s streetscape dedicated to a choice of cosmopolitan cafes, eateries and chic boutiques, there is everything and more for that truly memorable holiday. And then there is beyond – magnificent Four-Mile beach is a playground in itself - just a short 140 metre stroll and a hop, skip and a jump to the colourful strip of Macrossan Street shops, day spas and restaurants. Port Douglas offers front door access to the Great Barrier Reef and World Heritage rainforests, with any number of day tours providing ample things to see and do – or simply sit back, relax and soak up the sun – it’s yours for the taking. This is how the other half live – in a penthouse apartment with rooftop terrace. The world is your oyster and more when you luxuriate in the Port Douglas tropical lifestyle - so exclusive and meticulous in design, destined to relax the mind and spoil the senses. Entertain friends on the roof and drink in sublime sea and mountain views between cooling dips in your private pool and spa. Taking cue from the palest marine-based hues – think mother-of-pearl shell, white sand and naturally bleached coral - the interiors are cleverly interpreted in natural stone, satin finished bench tops, metallic painted artworks and premium quality furnishings for an overall feeling that is cool, clean and completely calm. The 2 Bedroom 2 Bathroom Penthouse Spa Apartment is a sumptuous, non smoking, luxury apartment offering a unique blend of indoor and outdoor living over 2 levels and further featuring 1 King Size Bed in the seperate luxury master bedroom with LCD TV, walk-through dressing room and spacious private bathroom with SPA BATH and seperate shower, your choice of either 1 Queen Size Bed or 2 Single Beds in the seperate second bedroom - please specify your preference in the Special Requests Section of your Booking, a second private bathroom with bath and seperate shower, a fully self-contained kitchen complete with stainless Miele appliances with everything and more provided for elegant entertaining including dishwasher, air conditioning, alarm clock, direct dial phone, hairdryer, radio, safe, ceiling fans, private laundry facilities with washing machine, clothes dryer and ironing equipment, a spacious seperate living area with plasma television, CD player, DVD player, FREE in-house movies, FREE Cable TV, wireless internet access, dining area and large outdoor entertaining terrace with undercover barbecue facilities. The penthouse, which is serviced every 5 nights, will satisfy the most discerning holidaymaker. The rate is for 4 guests. Maximum occupancy is 4 guests. Cots are available at an extra charge. Please note the Penthouse apartment includes a PRIVATE ROOF TOP SWIMMING POOL, SPA and BBQ. A whole new standard of Port Douglas apartments accommodation – so exclusive and meticulous in design, the apartment is destined to relax the mind and spoil the senses. The 2 Bedroom 2 Bathroom Terrace Apartment with Spa and Pool is a sumptuous, non smoking, luxury apartment comprehensively fitted out with laundry, kitchen and dining facilities and outdoor entertaining. Guests will fall in love with their own outdoor terrace that blends seamlessly with the indoors, with a spacious furnished balcony, private BBQ, dining table, amazing views over Port Douglas and PRIVATE SWIMMING POOL AND SPA!! The apartment further offers 1 King Size Bed in the seperate luxury master bedroom with LCD TV, walk-through dressing room and spacious private bathroom with SPA BATH and seperate shower, your choice of either 1 Queen Size Bed or 2 Single Beds in the seperate second bedroom - please specify your preference in the Special Requests Section of your Booking, a second private bathroom with bath and seperate shower, a fully self-contained kitchen complete with stainless Miele appliances including dishwasher, air conditioning, alarm clock, direct dial phone, hairdryer, radio, safe, ceiling fans, private laundry facilities with washing machine, clothes dryer and ironing equipment, a spacious seperate living area with plasma television, CD player, DVD player, FREE in-house movies, FREE Cable TV, wireless internet access, dining area and large outdoor entertaining terrace with undercover barbecue facilities. The apartment, which is serviced every 5 nights, will satisfy the most discerning holidaymaker. With tranquil sleeping areas well separated from the kitchen and living room with plasma television, children may rest while the parents kick up their heels or entertain friends. The rate is for 4 guests. Maximum occupancy is 4 guests. Cots are available at an extra charge. A whole new standard of Port Douglas apartments accommodation – so exclusive and meticulous in design the apartmenrty are destined to relax the mind and spoil the senses. The 2 Bedroom 2 Bathroom Balcony Spa Apartment is a sumptuous, non smoking, luxury apartment featuring a unique blend of indoor/outdoor living in the tropical north with a a spacious furnished balcony, private BBQ and amazing views over Port Douglas. The apartment further offers 1 King Size Bed in the spacious master bedroom - with private ensuite bathroom, your choice of either 1 Queen Size Bed or 2 Single Beds in the seperate second bedroom - please specify your preference in the Special Requests Section of your Booking, a second private bathroom with SPA BATH and seperate shower, a fully self-contained kitchen complete with stainless Miele appliances including dishwasher, air conditioning, direct dial phone, alarm clock, hairdryer, radio, safe, ceiling fans, private laundry facilities with washing machine, clothes dryer and ironing equipment, a spacious seperate living area with plasma television, CD player, DVD player, FREE in-house movies, FREE Cable TV, wireless internet access, dining area and large outdoor entertaining terrace with undercover barbecue facilities. The apartment, which is serviced every 5 nights, will satisfy the most discerning holidaymaker. The rate is for 4 guests. Maximum occupancy is 4 guests. Cots are available at an extra charge. Port Douglas Plantation resort is a private and spacious oasis comfortably located on the outskirts of Port Douglas, Australia - close enough to enjoy all the action yet far enough removed to completely relax and unwind. Modern, contemporary style accommodation set amongst 4 acres of lush manicured tropical gardens. Perfectly positioned to embark on all the adventures this magnificent region has to offer. This family owned boutique style resort is a home away from home offering friendly no nonsense, value for money service and hospitality. 2 bedroom 2 bathroom fully self-contained facilities can be either King/Twin or King/King configuration. Each bedroom has its own ensuite bathroom with hairdryer, air-conditioned, ceiling fan and large wardrobe storage facility. Internal laundry facilities with washer and dryer. The spacious combination lounge/dinning area has comfortable seating for 4, pay and free to air TV, clock radio, microwave, full size refrigerator stove top, air-conditioned, ceiling fans and opens to private patio or balcony with outdoor facility. Direct dial telephones, Internet friendly, fully fly screened and come equipped with pool towels and full complimentary personal amenities. Sleeps 4. Offering spacious, fully self contained 1 or 2 bedroom apartments, The Citysider is just 1km from the heart of Cairns. All apartments have a private balcony or patio and undercover parking. The property features a large outdoor pool and an undercover BBQ area. The Citysider tour desk will help with all your touring needs and car hire is also available to access areas such as Port Douglas, the Atherton Tablelands and Mission Beach. (Minimum 3 nights stay) 2 Bedroom Apartments include full kitchen, laundry, and spacious living areas. Featuring very large spacious & stylish apartments Clarendon on Spence Apartments are surrounded by fine restaurants, fabulous shopping and all so close to the Cairns Convention Centre and Cairns Casino. Guests staying at the Clarendon on Spence have the vibrant city lifestyle of Cairns at their fingertips. The Clarendon on Spence is prominently positioned in the heart of the city just a short stroll away is a vast array of activities including the popular new Cairns esplanade and lagoon development. The spacious 2 bedroom apartment has 2 separate bedrooms with ensuite bathrooms. The bedrooms are queen bedded. An extra roll away bed can be added for an extra guest at a cost. It also contains separate lounge dining with a full kitchen and a choice of pool and city views. The rooms include: split system Air Conditioning, large balcony, designer kitchen appliances, stove and microwave, toaster, kettle, crockery and cutlery, dining table and chairs, sofa and lounge, tea and coffee making facilities, washing machine and dryer, fridge, ironing board, direct dialling phone, ceiling fans, WI FI, hair dryer, SPA tub for 2, DVD and VCR player, 6 channels of Austar cable TV available at an extra charge. Non smoking hotel. Guests included is 4. Maximum number of guest 5. Extra guest charge $30 a night. Overlooking the picturesque Coral Sea on the Cairns Esplanade, unforgettable memories are created in the beautifully landscaped surrounds of Rydges Esplanade Resort Cairns, with a variety of superbly appointed rooms, outstanding dining facilities and a myriad of recreational activities. Rydges Esplanade Resort Cairns combines superior comfort and style with a range of luxurious accommodation options from Hotel Rooms, semi-self contained Studio Apartments to fully-self contained Tower Apartments. Rydges Esplanade Resort Cairns stylishly appointed rooms offer spectacular rainforest and sea views encapsulating the true beauty of Tropical North Queensland. The beautifully landscaped tropical gardens are home to a vast array of recreational activities. Relax beside one of the resort’s three tropical swimming pools or make the most of the fully equipped health and fitness club with a sauna, spa, two tennis courts and aerobic centre. Rydges Esplanade Resort Cairns's signature restaurant The Coral Hedge Brassiere specialises in casual dining offering delicious buffet style breakfasts and The Spectacular Fire and Ice Buffet for lunch and dinner. Located conveniently on the Esplanade, Rydges Esplanade Resort Cairns is in walking distance to a vast array of Cairns finest shopping and dining facilities. Rydges Esplanade Resort Cairns is also the perfect base to explore the Great Barrier Reef and World Heritage Rainforest Areas. The Resort offers Broadband access in all Hotel Rooms. Alternatively an internet cafe is set up in the hotel foyer. The reception is available for any secretary services that may be required. Enjoy a Semi Self Contained large 2 bedroom apartment suitable for most family Sizes with full access to all Resort Facilities including Tennis Courts, Gym , Swimming Pools and much more. Enjoy accommodation in a spacious full self contained 2 bedroom apartment located on the Esplanade suitable for most family sizes. Located a short walk to the city centre. Daily service not provided. Located in the new cityport precinct the Park Regis City Quays Cairns consists of brand new 1 & 2 bedroom fully self contained apartments and hotel rooms, all with broadband internet facilities, air-conditioning and private balconies. At the Park Regis City Quays Apartments guests can swim in the rooftop pool or book one of the many fabulous tours to the magnificent Great Barrier Reef or nearby rainforests. With the Cairns Convention Centre, casino and marina just one block away, the Park Regis City Quays is close to everything that makes Cairns a great holiday destination. These Cairns apartments are also just a short stroll to the Cairns Esplanade, markets, restaurants and cafes. Stylish and modern 2 Bedroom dual keyed apartment a Queen and 2 single beds or 2 Queen beds, full kitchen and laundry facilities, large private balcony, air-conditioning, ceiling fans, ironing equipment, direct dial phone, broadband internet access and a colour television. Situated in the heart of Cairns City opposite the new Cityport development, the Park Regis Piermonde Apartments consists of new 2 and 3 bedroom, fully self-contained apartment accommodation. These contemporary and spacious Cairns apartments have been acclaimed for their unique features, including the tropical swimming pool and beautifully landscaped recreational areas. All of the Park Regis Piermonde Apartments have generous balconies, most with harbour and city views and the apartment’s close proximity to cafes, restaurants and international shopping, provides an excellent base for both long and short term stays in Cairns. Stylish, modern and contemporary 2 Bedroom fully self contained apartment with full kitchen & laundry facilities, spacious private balcony, ceiling fans, spa bath, reverse cycle air-conditioning, video security intercom, ironing equipment and direct dial phones with internet access. Coral Towers is located on the newly renovated Cairns Esplanade with panoramic views of the ocean and Cairns city. It has been described as the ideal home away from home in tropical Far North Queensland. The spacious apartment accommodation at the Coral Towers Holiday Suites has been specially designed for those who want more than just a hotel room. Whether you are travelling to Cairns for business or pleasure as a family, group, couple or single the Coral Towers provides that little extra living space at a very affordable price. This 2 bedroom and 2 bathroom fully self contained apartment also features 1 Queen bedroom with ensuite bathroom, a 2nd bedroom with 2 Single beds and an adjoining bathroom, full kitchen and laundry facilities, private balcony with great Ocean views and are extremely spacious. 2B/2B APT Rate is for 1-4 Guests.Full Kitchen & Laundry in every apt. FREE Cable TV FREE Undercover Secure Parking. Full Tour Desk. Resort Style Pool & Heated Spa with Fantastic Views overlooking the Esplanade. Min 4 nights stay. Central Plaza Cairns is a 4 Star quality Apartment accommodation. Central location close to Cairns Base hospital, shops & the Esplanade. All apartments are spacious & modern with fully equipped kitchens, full size fridge. Laundry facilities incl. washing machine, dryer, iron, ironing board, clothes airer. Lounge/dining areas are air conditioned with ceiling fans (as are all bedrooms - a must for balmy Cairns weather). The Coral Reef Resort Cairns provides accommodation for one and two bedroom apartments units in Cairns. These Cairns apartments are fully furnished and providing good, clean, quiet accommodation during your stay in Cairns, at a reasonable rate, close to Cairns. Coral Reef Resort is located 2.5km from the central area of Cairns. 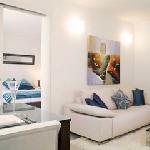 Two bedroom, air conditioned, fully furnished unit either on the ground level or one level up. Upper level has balcony. Queen size bed in the main bedroom and two single beds in the second bedroom.Fold out lounge suite in the living area for extra guests if required or single rollaway beds are available. Full laundry facilities in bathroom. [Washing machine and clothes dryer]. All units contain a full kitchen with utensils; lounge suite; TV, dining table and chairs in the living area. Villa Paradiso Beachfront Apartments are the essence of Palm Cove, just a few metres from the beach and the Coral Sea. Occupying a unique, absolute beachfront position amongst the giant Melaleuca Paper Bark trees and Palm Trees, Villa Paradiso Beachfront Apartments Resort are perfectly located on the Esplanade in the heart of Palm Cove amongst amongst some of the area's award winning restaurants. The BeachView Apartments at Villa Paradiso enjoys the very best location in Palm Cove! This grand iconic tranquil property offers a choice of 4.5 star luxury boutique 1, 2 or 3 bedroom self contained non smoking apartments . All are beach facing featuring expansive ocean views from the private balcony/patio and are the largest, most spacious apartments in Palm Cove. Ranging in size from 120 sq m up to 230 sqm, these apartments will delight those who require spacious beachfront accommodation at realistic rates. Each apartment further offers uniquely furnished interiors with handcrafted individually designed artifacts, King/Queen bedding, airconditioned bedrooms, 1 or 2 private ensuite bathrooms, hairdryers, colour TVs, FREE cable TV, DVD players, CD players, internet access, in-room safes, ceiling fans and louvered breezeways, STD telephone fully equipped kitchens with microwaves and dishwashers and full individual laundries with washing and drying facilities. Two lifts from the secure basement car park serve most apartments from the basement garage and the generous size of the apartments enable wheelchair access. A swimming pool (heated in the winter months), childrens pool and spa are in a sheltered area of the property. Free broadband and wireless internet access is available by the pool. Further facilities include BBQ facilities, dry cleaning service, laundry service, luggage storage and FREE car parking. The resident managers host a comprehensive tour desk and can provide independent advice and bookings for all tours. Adjacent are four cafes & restaurants, a Post Office, a beauty room, and a variety of fashion and beachwear shops. The central location of the BeachView Apartments at Villa Paradiso Resort, means that tours and day trips running within the area offer door to door, pick up and drop off services. Attractions within easy reach include Kuranda, the Daintree World Heritage Rainforest, Skyrail Rainforest Cableway, Great Barrier Reef tours and Cairns Tropical Zoo. The 2 Bedroom 2 Bathroom Beachfront Apartment is a beautifully decorated, spacious, non smoking and fully self-contained apartment featuring uniquely furnished interiors with handcrafted individually designed artifacts as well as a large private balcony with spectacular beach/ocean views. The apartment further offers an airconditioned master bedroom with 1 Queen Bed with ensuite bathroom, a second seperate airconditioned bedroom with your choice of either 1 Queen Bed or 2 Single Beds - please specify your preference in the Special Requests Section of your Booking, a second private bathroom with shower and toilet, hairdryer, a separate spacious lounge and dining area, colour TV, FREE cable TV, DVD player, CD player, wireless internet access, in-room safe, ceiling fans and louvered breezeways, direct dial STD telephone, wake up calls, a fully equipped kitchen with full size refrigerator, microwave and dishwasher, radio, alarm clock and full individual laundry with washing, ironing and drying facilities. The rate is for 4 guests. Maximum number of guests is 4. Children under 3 stay FREE OF CHARGE if using existing bedding. Palm Cove's newest (opened November 2006) luxury holiday apartments combine high style and practical choices for discerning holidaymakers. Located just 200 metres from Palm Cove's beach and esplanade, Elysium's superbly decorated studio, 1, 2 and 3 bedroom self contained holiday apartments all feature spacious, open plan living areas with floor to ceiling glass opening out to large private balconies. The small complex of 20 apartments occupies an elevated site on Veivers Road, Palm Cove, and includes a stunning outdoor pool deck/barbeque area, tour booking desk and undercover secure parking. Our modern & spacious 2 bedroom apartments are perfect for families or groups with plenty of room for everyone. The main bedroom has a king bed (or 2 singles) and a spacious ensuite, whilst the 2 bedroom has a queen bed, separate bathroom & full laundry located nearby. Whip up a gourmet meal in the supurb fully appointed kitchen including oven & dishwasher and then relax in air conditioned comfort in the large living room with TV, dvd & austar. Watching the sun set from the large private balconies is a great way to end the day and some rooms even have a view over the beautiful rainforest covered mountains. Broadband internet is also available. Oasis Palm Cove Australia is twenty minutes North of Cairns International Airport offering a unique mix of casual ambience and world class facilities in the picturesque beachside village of Palm Cove. Located only 80 metres from the beach and 150 metres from Palm Cove Village, stay in our luxurious and fully self contained apartments and suites as you soak up the relaxed and friendly hospitality. An exclusive accommodation complex, Oasis at Palm Cove occupies its own quiet cul de sac, and garden and recreational areas form approximately 70% of the site. Spacious 2 bedroom apartment with king size bed, walk-in robe & ensuite in main bedroom. King or Twin with separate bathroom with bath. Fully equipped kitchen & laundry. Air-conditioned with ceiling fans & fully screened. Pay TV, DVD, Stereo & wireless internet. Large private blacony. The Trinity Beach apartments are a relaxed and friendly home away from home for couples and families. Marlin Gateway Holiday Apartments have just 16 apartments and all are spacious and fully self-contained with access to a swimming pool, barbecue, and other facilities to make your holiday extremely comfortable. The North Queensland's tropical climate combined with Marlin Gateway's large modern air-conditioned apartments ensures a comfortable stay while you relax and unwind on holiday. All apartments are serviced weekly (or more often by arrangement) and all linen is supplied. Fully self contained 2 bedroom apartment with bedding configuration of either 1 queen and 2 single beds or 2 queen beds. Each apartment has 1 bathroom with shower and bath, full kitchen facilities including microwave, stove and fridge/freezer, living/dining area, private laundry facilities and private balcony. Offering excellent boutique apartment accommodation in Palm Cove, Far North Queensland, Palm Cove Tropic Apartments is located an easy 20 minute drive north of Cairns International Airport and is an ideal base from which to explore all that this tropical region of Queensland has to offer. Choose from 1 or 2 bedroom self contained apartments that feature well-equipped kitchens, laundry facilities, and spacious balconies. Enjoy staying in apartment accommodation that will become your home away from home! Our resort facilities include the free-form swimming pool which is surrounded by giant melaleuca trees and tropical palms creating a secluded and relaxed environment. At the rear of the pool is a large undercover barbecue area which is a popular meeting place for guests to relax and socialise. Adjacent to the apartments is a rainforest area which is home to many species of birds and butterflies. Our property is situated just 50 metres from the palm-fringed beaches of Palm Cove and a block from the village where you can find a plethora of shops, restaurants and cafes. Address : 6 Triton Street, PALM COVE., Qld. 4879. 2 Bedroom fully self contained apartment. A King size bed and 2 King singles with plenty of room to move. Private verandah`s to all apartments. Quiet location. Come and enjoy the relaxed lifestyle and friendly hospitality at The Villas Palm Cove, located just 20 minutes north of Cairns. Offering self contained villas perfect for couples and families, our accommodation is only a short walk from Palm Cove beach, esplanade and many local eateries, and provides the ideal location from which to explore the beauty of the Great Barrier Reef, Daintree Forest and all the local beaches. Our villas are spacious and beautifully furnished and all have a private courtyard. They are perfect for both longer and short-term visits to Palm Cove. Enjoy our facilities including swimming pool and spa, BBQ facilities, internal lawned area for children, babysitting service and a Free Tour Booking Desk at reception, wireless broadband internet. Fully self contained 2 bedroom Palm Cove apartments complete with its own private swimming pool, a private courtyard / patio area, fully euqipped kitchen, air-conditioning and free car parking. These 2 bedroom Palm Cove apartments are fully self contained with their own private courtyard / patio area, fully euqipped kitchen, large and spacious living area, air-conditioning and free secure car parking. Koala Court features superior one, two and three bedroom fully self contained holiday apartments situated adjacent to the CBD of Cairns. We provide comfortable living in a relaxed tropical atmosphere. Our lush tropical gardens, salt water pool and BBQ area enhance your stay. Our properety is rated AAA four and a half star and the units include full kitchen facilities (dishwasher in 2 & 3 Br appt.) microwave, private laundry, air-conditioning and ceiling fans, security safe, in house movies, satellite TV, direct dial phones, hair dryer, resident manager and a full tour booking service. Seaforth Trinity Beach Apartments were built in 2003 and are located 15 minutes from Cairns CBD on the beautiful Marlin Coast at Trinity Beach. Situated only a leisurely walk from the shopping centre, gym, restaurants, casual eateries, tavern and beach, the Seaforth Trinity Beach Apartments offer 32 fully self contained spacious 2 and 3 bedroom luxury holiday apartments. All apartments include private courtyards or balconies, a fully equipped laundry, 2 bathrooms, air conditioning and ceiling fans, a fully equipped kitchen including dishwasher and microwave, direct dial local telephone and TV. Guest services include under cover parking, visitor’s car park, exclusive storage room, large resort style salt water pool and spa, BBQ, free tour bookings (pickup at front door), car rental, safe at reception, fax and email facilities, baby sitting service, and on-site management. Delightful, spacious fully self contained 2 bedroom apartment featuring 1 x queen bed & 2 x single beds as well as a private courtyard/balcony, a fully equipped kitchen including dishwasher and microwave, a fully equipped laundry, 2 bathrooms, air conditioning, ceiling fans, direct dial local telephone and TV, DVD player. Children under 3 years free using existing bedding. Cot & high chair hire available at extra charge Rates are for 4 people. Max. 5 people. Extra guests applies. Please note the max. no guests cannot exceed 5 guests in total.